You see that there is a list of pretix user accounts (i.e. email addresses), who are part of the team. To add a user to the team, just enter their email address in the text box next to the “Add” button. If the user already has an account in the pretix system they will instantly get access to the team. Otherwise, they will be sent an email with an invitation link that can be used to create an account. This account will then instantly have access to the team. 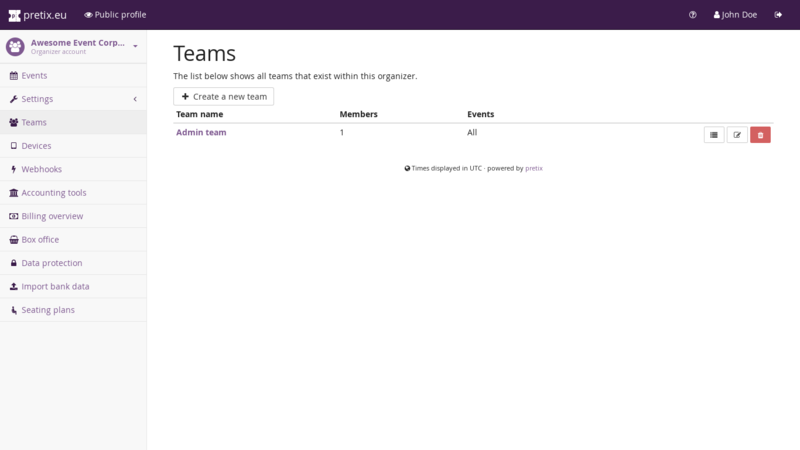 Users can be part of as many teams as you want. 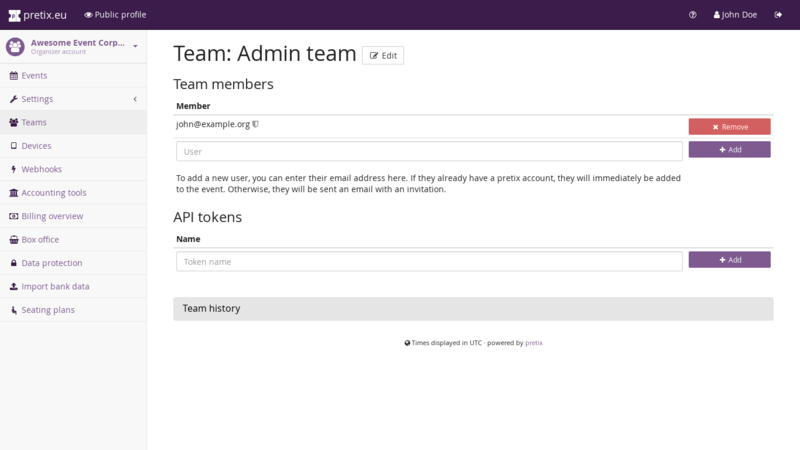 In the section below, you can also create access tokens for our REST API. You can read more on this topic in the section Authentication of the API documentation. Can change teams and permissions – This permission is required to perform the kind of action you are doing right now. Anyone with this permission can assign arbitrary other permissions to themselves, so this is the most powerful permission there is to give. Can change organizer settings – This permission is required to perform changes to the settings of the organizer account, e.g. its name or display settings. 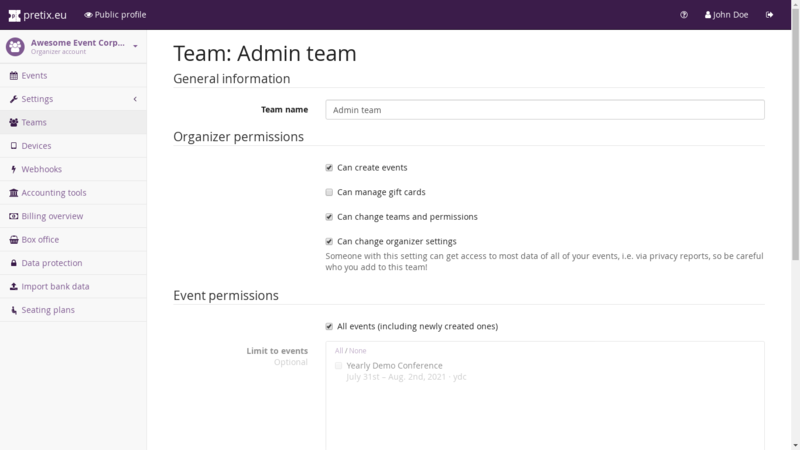 Can change event settings – This permission gives access to most areas of the control panel that are not controlled by one of the other event permissions, especially those that are related to setting up and configuring the event. Can change product settings – This permission allows to create and modify products and objects that are closely related to products, such as product categories, quotas, and questions. Can view orders – This permission allows viewing the list of orders and all individual order details, but not changing anything about it. This also includes the various exports offered. Can change orders – This permission allows all actions that involve changing an order, such as changing the products in an order, marking an order as paid or refunded, importing banking data, etc. This only works properly if the same users also have the “Can view orders” permission. Can view vouchers – This permission allows viewing the list of vouchers including the voucher codes themselves and their redemption status. Can change vouchers – This permission allows to create and modify vouchers in all their details. It only works properly if the same users also have the “Can view vouchers” permission.